I started making homemade popcorn back in college...it was tradition for me and my roommates to make popcorn and watch The OC or American Idol. It's really quite simple and the best part is that you get to add your own ingredients, to make it extra special. My hubby and I added freshly grated Parmesan and pepper to make this classic extra delicious! Heat the oil in a saucepan on medium heat. Add 2-3 kernels of corn to pan and cover. When the kernels pop, add the rest of the 1/3 cup of popcorn kernels in an even layer. Cover, remove from heat and count 30 seconds. This method first heats the oil to the right temperature, then waiting 30 seconds brings all of the other kernels to a near-popping temperature so that when they are put back on the heat, they all pop at about the same time. Add salt and pepper to taste and toss in the Parmesan cheese. 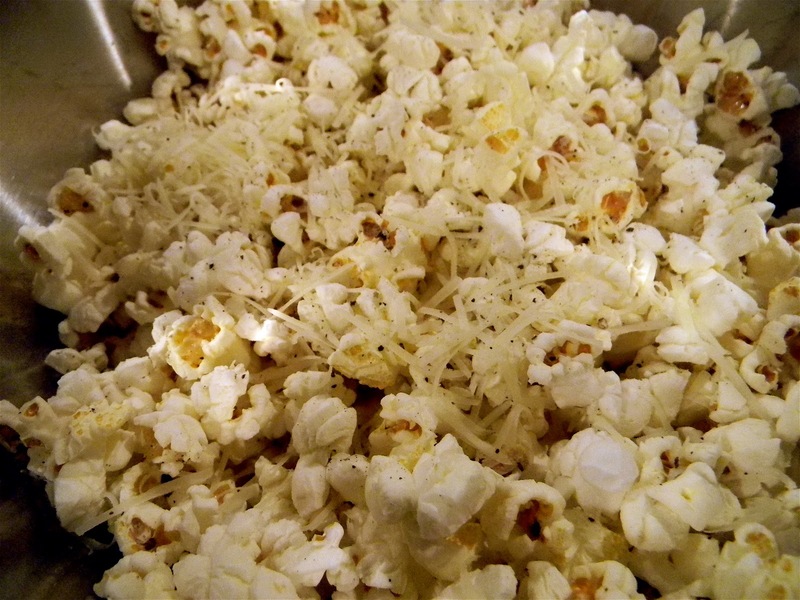 This popcorn is a perfect blend of salt and pepper and the cheese adds a nice texture. Let me know if you add anything special to your popcorn! Bon Appetit! YUM! Homemade popcorn is one of my all-time favorite foods, such a good idea to add Parmesan. Can't wait to try this! YUMMMM! That sounds to die for! Must try it! My Mediterranean-inspired superfoods popcorn is delicious and oh-so healthy! I use olive oil, oregano, freshly squeezed lemon juice, lemon pepper and Himalayan salt. If you want to get really crazy you can add pumpkin seeds. Yummy!